Democratic Republic of the Congo: The Tembo translation team members are displaced from their homeland because of militia activity. They are living in the city of Goma which itself came under bombardment in late August. In spite of this they continue to meet together to pray and work because they know that the Scriptures are eagerly awaited by the Tembo people. Please pray that the team's material and financial needs will be met – the three translators are currently sharing one computer which needs a constant power supply, significantly slowing their work. Pray that their goal of completing the New Testament in 2016 may be fulfilled. We need people to go to the Congo! The Democratic Republic of the Congo is a high strategic priority for Bible translation in Africa, with around 3.5 million people without Scripture—speaking 91 different languages. In recent years we’ve been steadily increasing our support for Bible translation there, partnering with local Christians committed to getting God’s Word to their people. Today we have the opportunity to share in launching translations in several of these languages, and you may be the key! We are recruiting for a Language Program Manager to coordinate the teamwork and budgets for these new translation teams. We also need an IT Specialist to manage the communications network, linking remote teams to their main office. The Democratic Republic of the Congo (DRC) is an Ocean of Trees – that is what impressed me the first time I visited. I had just flown a small airplane across the Atlantic, so I had a fresh impression of the ocean’s vastness. Then I had flown across the Western Sahara desert. From horizon to horizon, an ocean of sand. As I flew into Central Africa, the contrast of emerald green trees was breathtaking. It truly is a jungle out there! Both of these positions are located in Gemena, DRC. This is the provincial center in the northwestern region, a city of around 138,000 people. The international team there uses French as their working language; so get ready to learn conversational French! No language experience is required for the Language Program Manager position, but we are looking for someone with solid management experience. Naturally the IT Specialist needs to have network, hardware, and software support skills. Grass airstrips are crucial to accelerating translation efforts. Who knew that lawn mowers could play such an essential role in Bible translation? 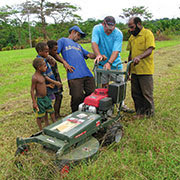 But in the remote village of Musula, Papua New Guinea, where a grass-and-dirt airstrip makes it possible for Bible translators and supplies to be flown in and out, a high-powered lawn mower has saved the day when it comes to translating the Scriptures. Keeping the Musula airstrip safe takes constant effort because of the region’s extremely wet climate. While nationals are willing to help, they are very poor, and every hour they work on the airstrip is an hour they aren’t working in their fields to feed their families. The lawn mower will greatly expedite their airstrip maintenance efforts. Thank you for helping in this very tangible way to bring the translated Scriptures to the Kasau people. One way we are protecting Bible Translators from the chaos of political and sectarian conflicts is by giving them communication tools not controlled by governments. (Orlando, Florida, USA)—Wycliffe Associates, an international organization that involves people in the acceleration of Bible translation, announces that it will begin assisting Bible translators in a region of the world that can’t be identified due to credible dangers for Christians there. The organization will support local, mother-tongue translators with administrative, financial, and technical support, which includes providing translators with Bible Translation Acceleration Kits. Each kit consists of a small, portable netbook computer, satellite communication terminal, solar panel, battery, and power supply. This technology makes it possible for Bible translators in remote locations to communicate through satellite connections with translation consultants at distant locations in real time, enabling valuable collaboration with other translators and reducing or eliminating the need for dangerous travel. Wycliffe Associates also plans to support training for Christians there in Bible translation, evangelism, discipleship, and church planting. One local translator has been arrested numerous times, beaten, and imprisoned for his faith. A former militant who once targeted Christians for arrest, torture, and imprisonment, this translator converted to Christianity and became a target himself, along with his family. He began working closely, in secret, with Bible translators in the region to help translate the Scriptures into his language. There are currently 52 language projects in this region that Wycliffe Associates intends to support with new technologies and resources. The organization is currently seeking to raise $165,000 this year to fund those efforts. “God is opening hearts in such miraculous ways among people who have been previously closed to the gospel,” says Smith. “We simply can’t afford not to respond. In 2009, Wycliffe Associates launched a new project called Scriptures for New Frontiers to support Bible translators and missionaries who are putting their lives at risk to work in extremely volatile regions of the world, where an estimated 1,000 languages, representing 280 million people, are without the Scriptures. Support provided through Scriptures for New Frontiers includes training for national translators, the expansion of housing for translators, their families, and translation team members, the provision of schoolteachers to work within local cultures, and emergency funds for missionaries who are being targeted by militant groups. Last year, the organization mobilized 3,145 volunteers and staff members to accelerate Bible translation in 71 countries. Additional information is available at www.wycliffeassociates.org or by calling 1-800-THE WORD (1-800-843-9673).